In early markets, when the price for a stock or security might be established only once or twice a day, the chart was extremely simple. It was merely a graph of closing prices connected by a line, sometimes directly connected, and sometimes connected by perpendicular lines. In Japan, this type of chart was called a “tome” chart from the word “tomene,” which means “close.” In the Western world, this type of chart is still used and is called a “line” chart. When trades became more frequent, chart forms took two paths. The first and still most common style was borrowed from the bar graph or stick graph and portrayed the high and low with a “floating” vertical line not connected to the base line. These were called “bar charts” or “vertical line charts.” Interestingly, in Japan, where many chart types were developed, the original plotting of price data was from right to left rather than the now universal method of plotting from left to right. This bar style then evolved into the “candlestick” chart, which uses the same information as the bar chart but has a more appealing appearance to the eye. The other path was called the “price movement line,” where prices were recorded as they occurred, and only the ones that deviated from earlier prices by a specified amount were graphed in a line. This method of price plotting is the forerunner to the modem “point-and-figure” chart. Today, the three most common types of charts that record prices at given time intervals (such as hourly, daily, weekly, or monthly) are line charts, bar charts, and candlestick charts. Let us look at each of these charts and how they differ. Figure is an example of a line chart. These simple charts provide information about two variables, price and time. 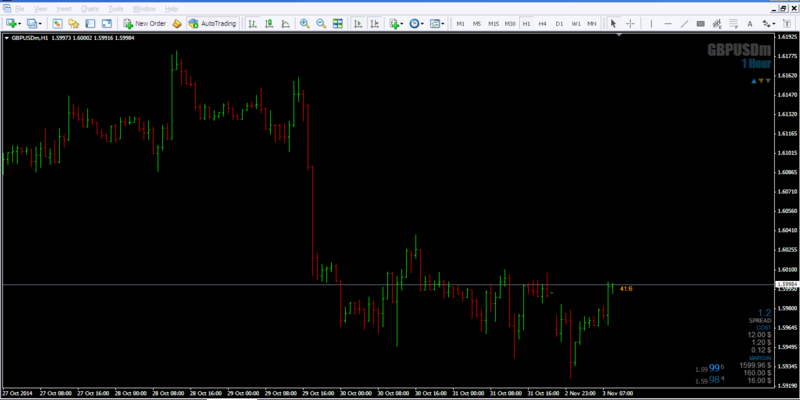 In Figure, the price variable is the Hourly closing price for GBBUSD. A line chart has price data on the vertical, or y, axis. A time measure is placed on the horizontal, or x, axis. Simple line charts are especially useful when studying long-term trends. Because line charts display summary statistics, they are often used when information about several different variables is being plotted in the same graph. Line charts, however, can be used to present data collected at any time interval. More frequent data collection will lead to a more detailed, but more cluttered, graphical presentation. Especially when studying long-term trends, these extra details muddy the waters and obscure a basic trend. Although the line chart visually displays one piece of information for each time interval, a bar chart shows at least three pieces of information: the high, the low, and the closing price for each time interval. Some bar charts also contain a fourth piece of price information, the opening price. Each time interval (that is, day, week, or five minutes) is represented by one bar. Figure is an example of a Hourly bar chart. Each bar represents Hourly price action. Just as with the line chart, price data is placed on the vertical axis, and time is measured on the horizontal axis. 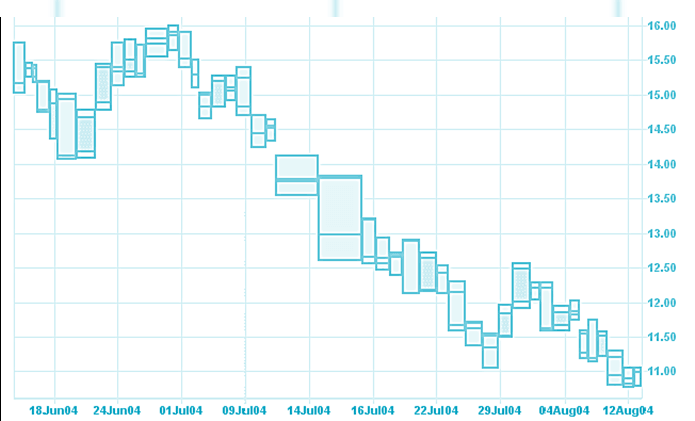 A vertical line shows the trading range for that day. The top of this vertical line represents the highest price at which the security traded on that hour; the bottom of the bar represents the lowest trading price of the Hour. A longer line denotes a wider trading range during the hour. Likewise, a short bar means that the spread between the highest price during the hour and the lowest price during the hour was small. A small tick mark on the right side of the bar indicates the closing price for the hour. If the opening price for the hour is recorded on the bar chart, it is represented by a small tick mark to the left side of the bar. Candlestick charts originated in Japan. This charting method was used as early as the mid- 1600s to trade rice futures in the Japanese markets and continues to be the most popular form of technical analysis in Japan. These techniques have been widely used in the Far East for many generations, but not until the publication of the book Japanese Candlestick Charting Techniques by Steve Nison in 1991 were Western traders introduced to candlestick charts. Before the publication of Nison’s book, very few U.S. and European services offered candlestick charts. Today, almost every technical analysis software package and technical service offers candlestick charts. You can even create candlestick charts through the charting options in Excel. Candlestick charts are similar to bar charts in their construction. Both charts use the high price, low price, and closing price; candlestick charts also always include the opening price. To construct a candlestick chart, the low and high prices are plotted on a thin bar, just as they would be for the bar chart we just discussed. A. box is used to represent the opening and closing prices. To create this box, a horizontal mark is made at both the opening and closing prices; a rectangle is formed using these two horizontal marks. This rectangular box is called the real body of the candlestick. If the security closed at a higher price than it opened, the real body is white or open. These white, or “open,” real body candlesticks indicate price advances from the opening. Conversely, if the closing price falls below the opening price, the real body of the candlestick is shaded. These candlesticks with a “closed” or black, real body designate price declines from the opening. The point-and-figure chart records price data using a very different technique than line, bar, and candlestick charts. At first, it may appear that the construction of these charts is somewhat tedious. In addition, these kinds of charts are rarely published or discussed in the popular financial news. Because many of the point-and-figure charts are constructed using intraday trading data, use of these charts was historically limited to professional analysts who had access to intraday data. However, with some practice, you will see that point-and-figure chart construction is not that difficult and provides an interesting and accurate method of price analysis. Point-and-figure charts account for price change only. Volume is excluded; and although time can be annotated on the chart, it is not integral to the chart. The original point-and-figure charts took prices directly from the tape as they were reported in the “Fitch Sheets” and by services prepared especially for point-and-figure plotting, such as Morgan, Rogers, and Roberts. Most of these services were put out of business by the computer and the use of the three-box reversal charts. The reading of each stock or commodity trade by trade was a laborious process. Today, very few services provide the data to plot one-point reversal charts. The origin of point-and-figure charts is unknown, but we know they were used at the time of Charles Dow around the late nineteenth century. Some have thought that “point” came from the direction of the entries on the chart, pointing either up or down, but more likely “point” refers to the location of the price plot, which at first was just a pencil-point mark. “Figure” comes from the ability to figure from the points the target price. Construction of a point-and-figure chart is very simple because only prices are used. Even then, only the prices that meet the “box” size and “reversal” size are included. Finally, the chart reflects the high and low of the period, whenever it is important. Many technicians believe that the high and low of the day are important numbers determined by supply and demand and are more important than the opening or closing prices, which occur at single, arbitrary moments in time. As with all of the charting methods, different analysts use variations of point-and-figure charting to best meet their particular needs. 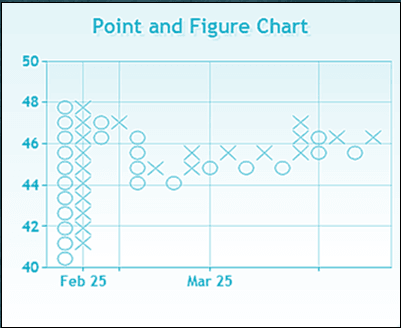 We will begin our discussion of point-and-figure chart construction by looking at the oldest method, referred to as the one-point reversal pointand- Sgure method. Further information about these one-point reversal charts can be found in reprints of Alexander Whelan’s Study Helps in Point and Figure Technique. Equivolume chart developed by Richard W. Arms Jr., EquiVolume is a price plot that incorporates volume into each period. EquiVolume charts looks similar to candlestick charts, but the candlesticks are replaced with EquiVolume boxes that can be square or rectangle. Classical patterns, such as triangles, wedges and double tops, still show up with the added bonus of having volume built right into the pattern. This makes it easier to verify volume for reversals, big moves, support/resistance breaks and climaxes.